The speed of a dc motor can be controlled by varying the voltage applied to the armature of a dc motor. A separately excited dc motor with variable armature voltage finds application as a drive motor in a variable speed drive. The variable armature voltage is provided by a phase controlled rectifier. The schematic of an Transfer Function of Armature Controlled DC Motor is shown in Fig. 6.7. 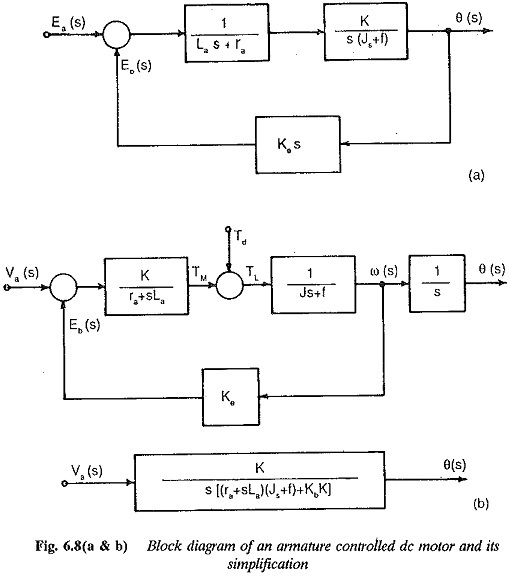 The block diagram given in Fig. 6.8(a) represents Eq. 6.13. This can be finally reduced to a single block given in Fig. 6.8(b). where K is constant. If the poles of this transfer function are complex conju­gates the speed change for a change in the load torque is oscillatory.